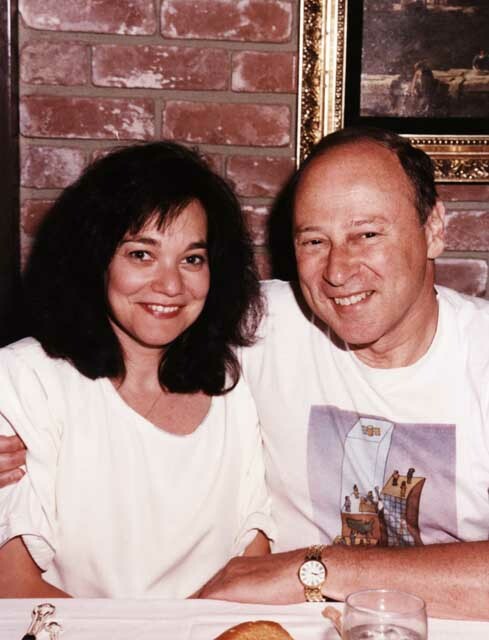 LIKE HER HUSBAND MAX, Adele Korff Gass had little say in her career choice. 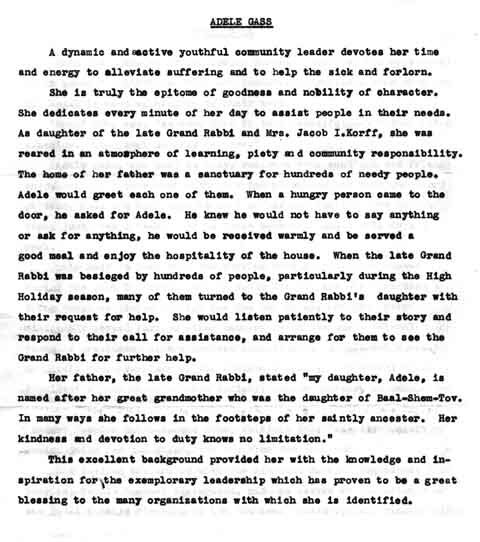 As the daughter of Jacob Korff, a Hasidic grand rabbi, she was reared to care for others and put the needs of the poor or sick ahead of her own desires. Adele’s life work outside her family was her enormous contribution to charitable causes. 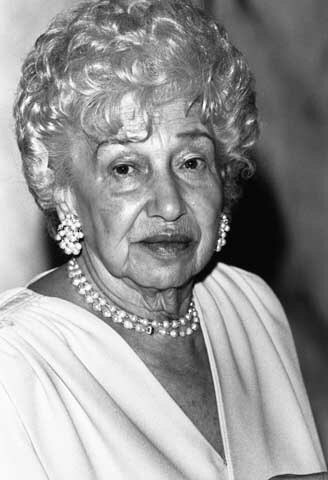 She was every bit as successful in her realm as her older brothers, Rabbi Samuel I. Korff and Rabbi Baruch Korff, were in theirs. The sampling of newspaper clippings below, showing her charity work, is just that, a sampling. They barely reflect the scope and depth of the charitable works that Adele engaged in throughout her adult life. What makes Adele’s accomplishments even more remarkable was that Adele was a high school dropout. She was never given the educational opportunities granted her brothers and was even encouraged to leave high school a semester before graduation in order to marry Max. However, it should be noted that she recognized the value of educating women and she encouraged her own daughter to get a college diploma. This appears to be the text of speech that describes Adele’s charitable works and devotion to helping those in need. 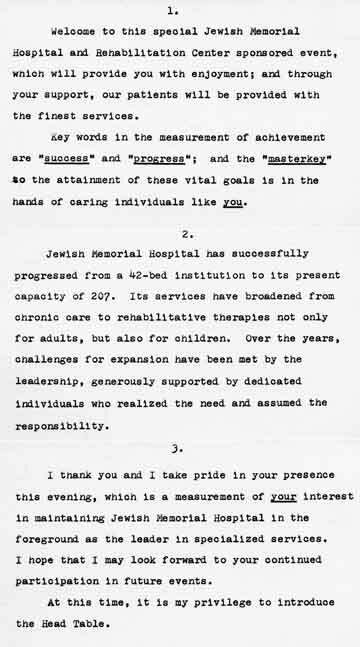 Perhaps it was the speech given when she was named Woman of the Year by Jewish Memorial Hospital. 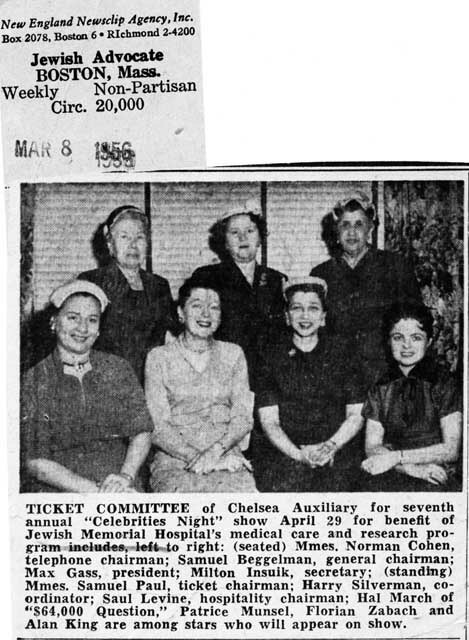 In addition to Jewish Memorial Hospital, Adele at various times in her life devoted her energy to the Red Cross Ambulance Corps, Chelsea Hadassah (where she was vice-president), Children and Ladies’ Aid Society, Women’s Division of the Combined Jewish Appeal (co-chairman of the local chapter), and the High School Parent-Teachers Organization (vice-president). Adele was also a member of HIAS, Chelsea Hebrew School, North Shore Hebrew Academy, Jewish Women’s Convalescent Home, Multiple Sclerosis Aid Society, YWHA, Jewish Guild for the Blind, Hebrew Home of the Aged, Mizrachi Women’s Organization of America, and Temple Emmanuel Sisterhood. 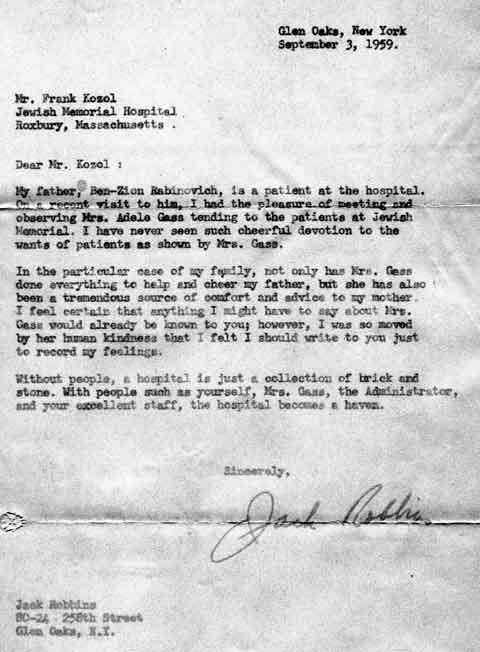 Jewish Memorial Hospital was the institution dearest to her heart. 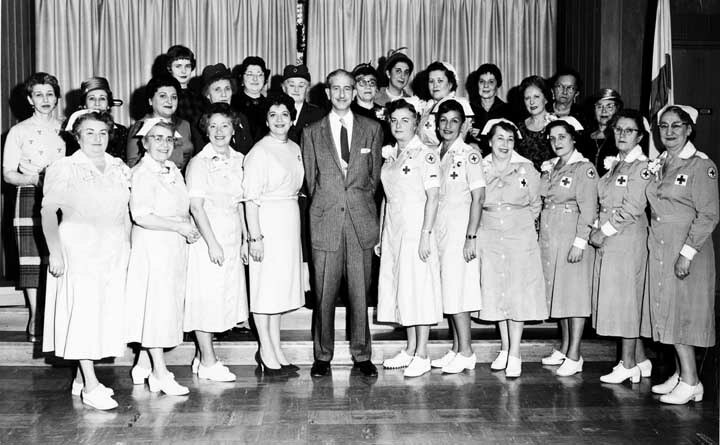 The hospital, located in Roxbury (a once predominantly Jewish neighborhood of Boston), provided active medical care and rehabilitation services to patients with a wide-range of prolonged illnesses. 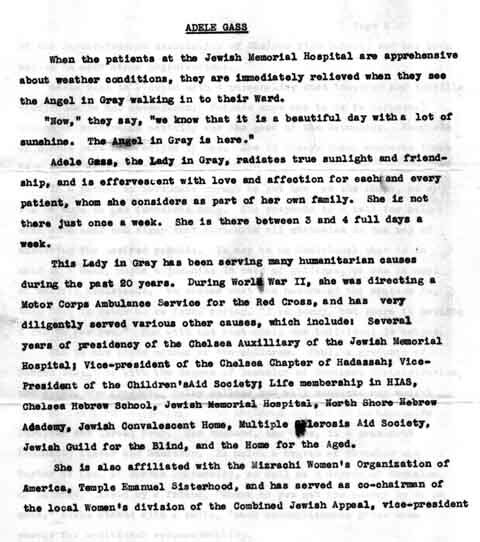 In her younger days, Adele volunteered at the hospital as a “Lady in Gray” three to four full days weekly, tapering off to one day a week near the end of her life. 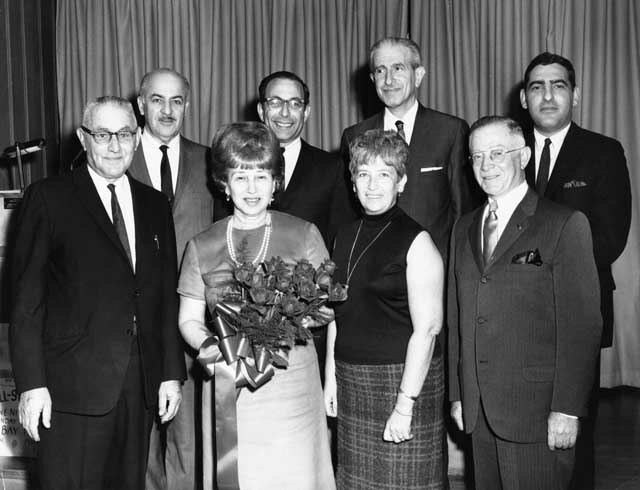 She was active in both patient-related services and organizational functions, and was even named an honorary director of the hospital. 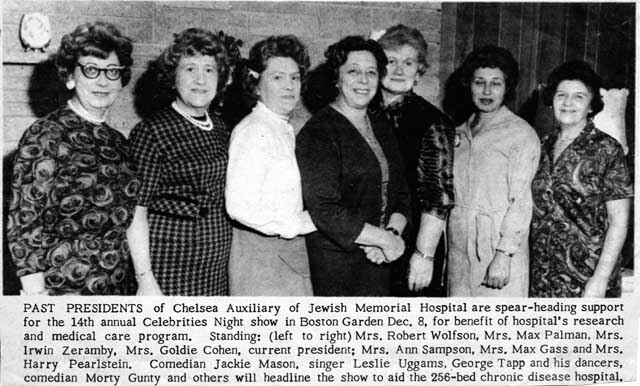 Adele also served as president of the Chelsea Auxiliary of the Jewish Memorial Hospital several times during her five-decade association with Jewish Memorial Hospital, raising funds year after year for research and patient care. 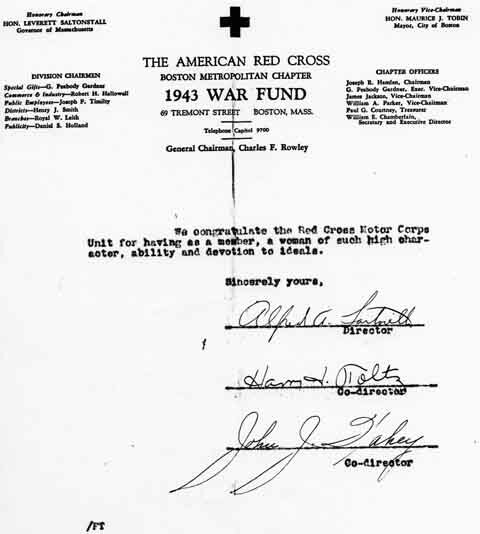 This letter from 1943 acknowledges the amazing fund raising capabilities of Adele on behalf of the American Red Cross. 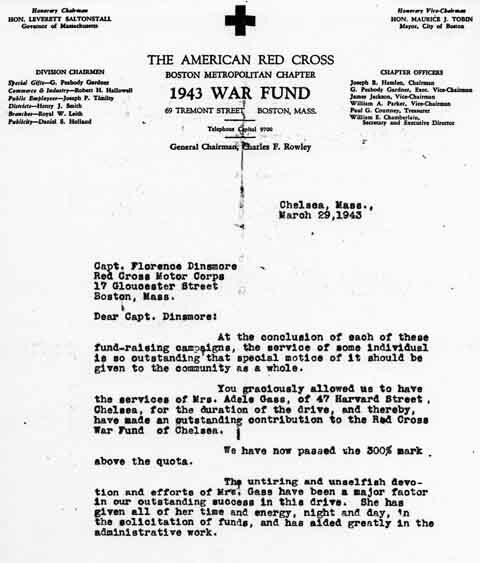 She helped to raise more than three times the target goal set for Chelsea, Massachusetts. 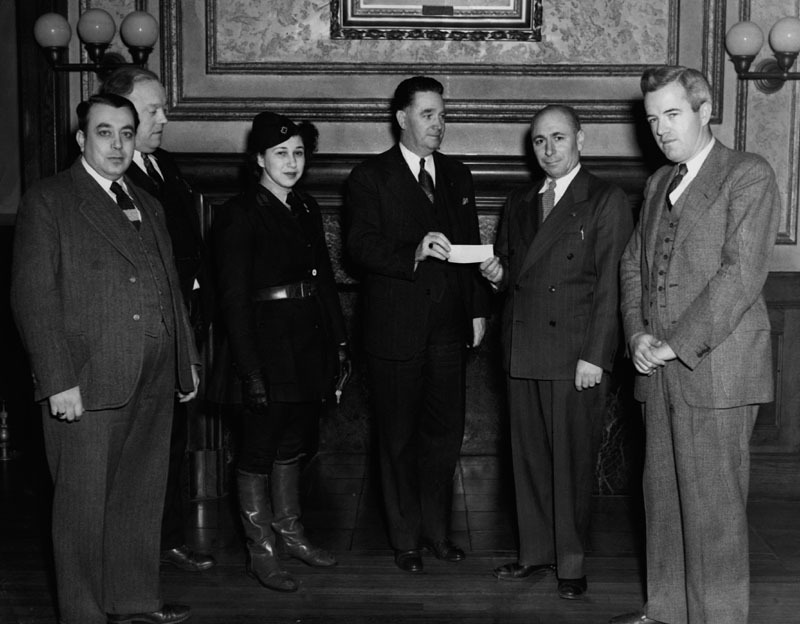 In this photograph Adele is wearing her Red Cross Motor Corps volunteer uniform. Note that a check is being passed from one of the participants to another. Perhaps the check symbolized the funds that Adele helped to raise for the Red Cross in Chelsea. 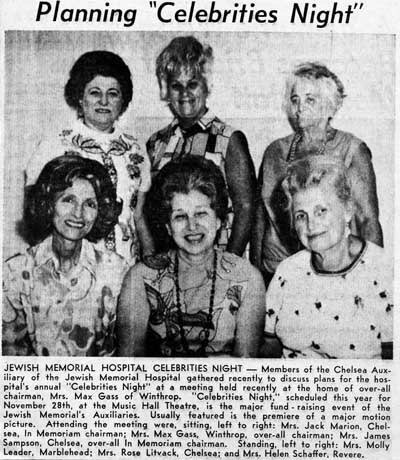 One event that she was particularly dedicated to was the annual benefit fashion show that she sponsored on behalf of Jewish Memorial Hospital. Article Reprinted courtesy of The Jewish Advocate; Photos in article ©1991 Atlantic Photo, Boston. Credit: ©1991 Atlantic Photo, Boston. Reprinted here with permission. Adele with Stanley Fertel, President of Jewish Memorial Hospital, at a fashion gala at the Copley Plaza Hotel presented by Bloomingdale’s to benefit the hospital. 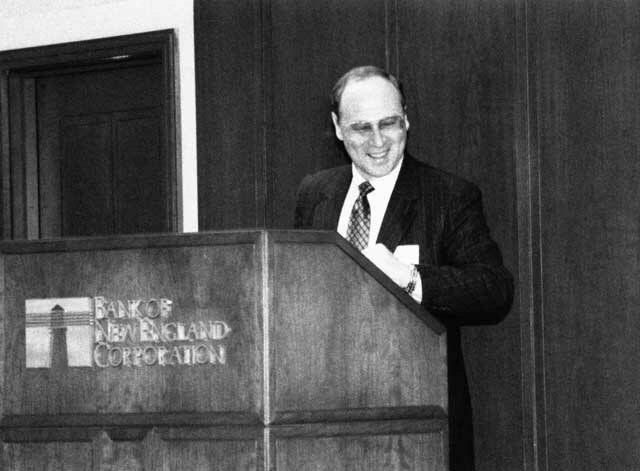 Credit: ©1990 Atlantic Photo, Boston. Reprinted here with permission. 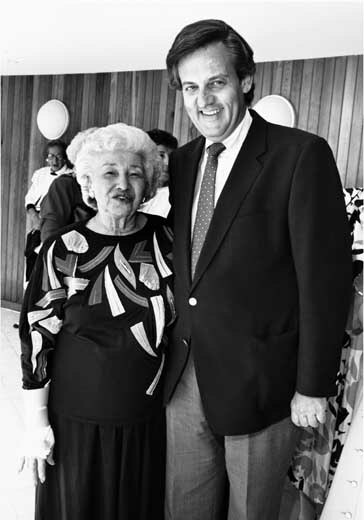 These photos were taken at Jewish Memorial Hospital events in 1990. 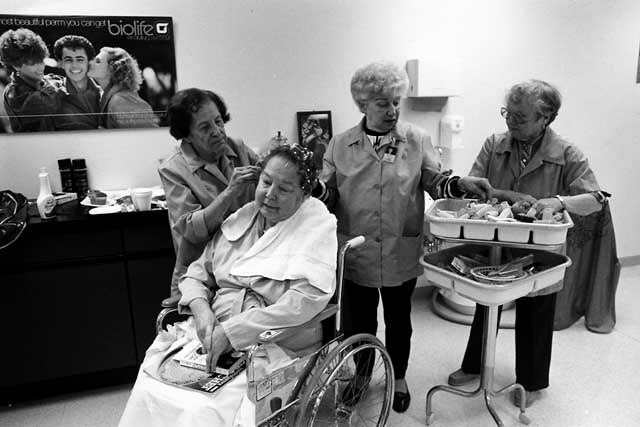 Perhaps the one accomplishment she was most proud of in her tenure at the hospital was establishing a beauty salon so patients could make feel better about their appearance. Credit: ©1989 Atlantic Photo, Boston. Reprinted here with permission. Accolades for Adele’s efforts sometimes came in the form of heartfelt letters of appreciation. 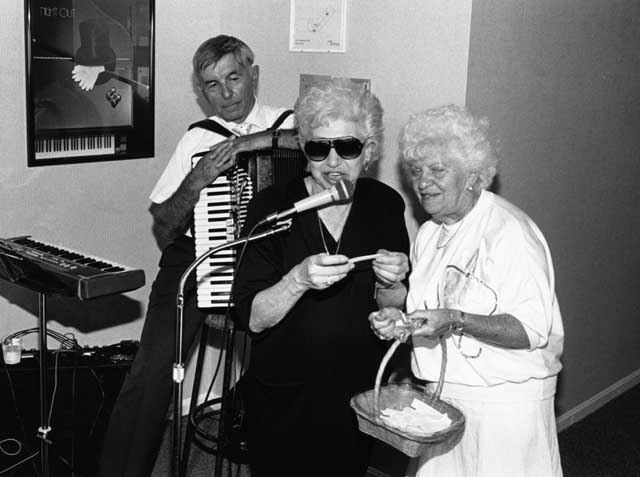 Although her charity work took Adele away from the home, Max wholeheartedly supported her efforts from the beginning, and he even wrote her speeches in the early years before she mastered the technique herself. 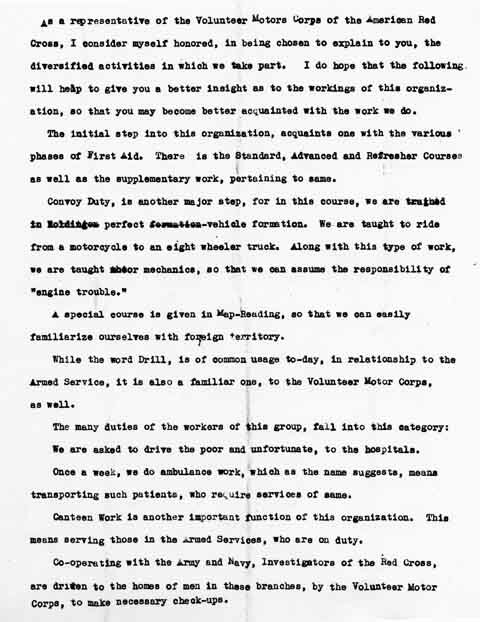 This is a speech Adele gave explaining the role of the Volunteer Motor Corps of the American Red Cross in serving the community. It was written by Max as the writing style mirrors his formal writing style. These note cards are from a speech that Adele prepared herself. 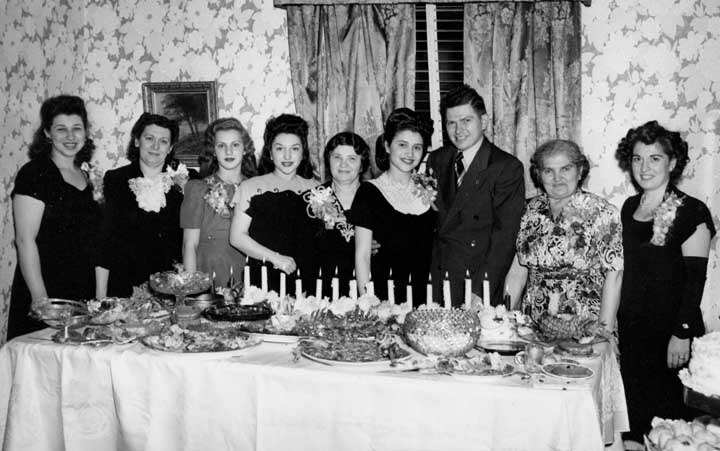 Adele enjoyed hosting engagement parties for her sisters, and later for her nieces and nephews. Below are photographs from the party she gave to celebrate the engagement of her sister Molly Korff to Abe Weinberg. 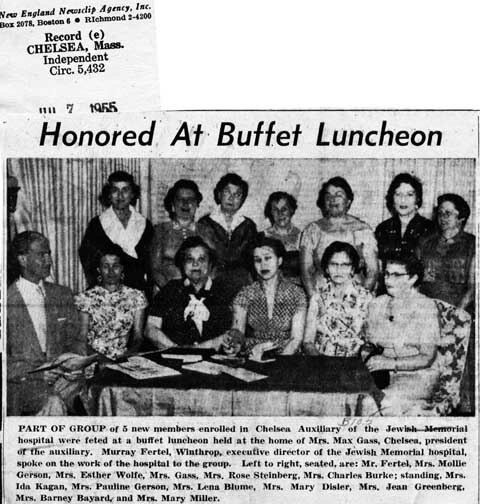 Left to right: Adele Korff Gass, Nesha Korff, Pauline (Polly) Korff, Betty Korff, Etta Korff, Molly, Abe, Abe’s mother (? ), Abe’s sister (?). Adele probably did most of the cooking. 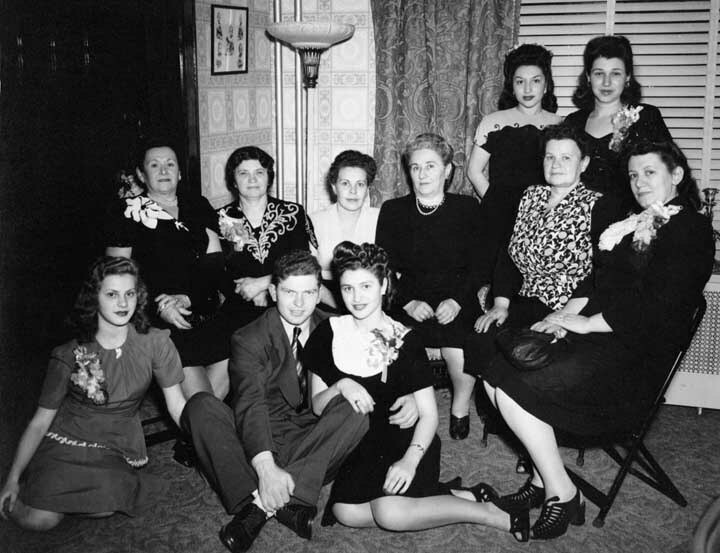 Front, left to right: Polly Korff, Abe Weinberg, Molly Korff, back: ?, 2nd row: Etta Korff, ?, perhaps Walter Berkowitz’s mother (? 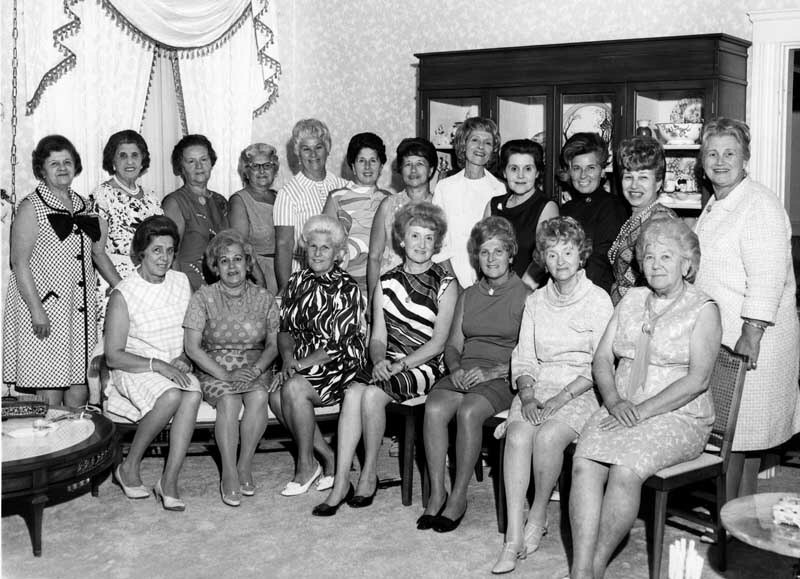 ), ?, Nesha Korff, standing in back: Betty Korff and Adele. Adele especially enjoyed visits from the children and grandchildren of hers and Max’s siblings. 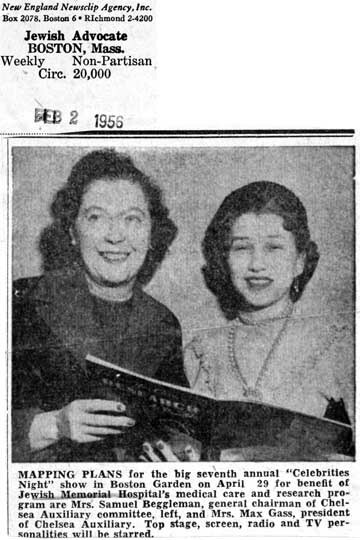 She is pictured here with one of the sons of her sister Polly. “Adele was returning from Israel on the day that Polly had the cerebral hemorrhage and she came directly from the airport to the intensive care unit at Mass General Hospital to be with us. She hardly ever left the hospital over the next three or four months while Polly was in a coma even though we had special duty nurses around the clock. Adele would come at 8:00 in the morning and sit with Polly and help the nurses take care of her all during that period. “When Polly came home from the hospital, Adele was right there to help with the therapy and she was a great help to me. We had three shifts of nurses every day. When for one reason or another the nurses weren’t able to come to the house, Adele would come—in many instances in bad weather, even raging snowstorms—to enable me to go to work. Our medical insurance picked up the tab for the hospital expenses but they did not cover the expense of private duty nurses at home and we didn’t qualify for government assistance such as Social Security disability insurance. 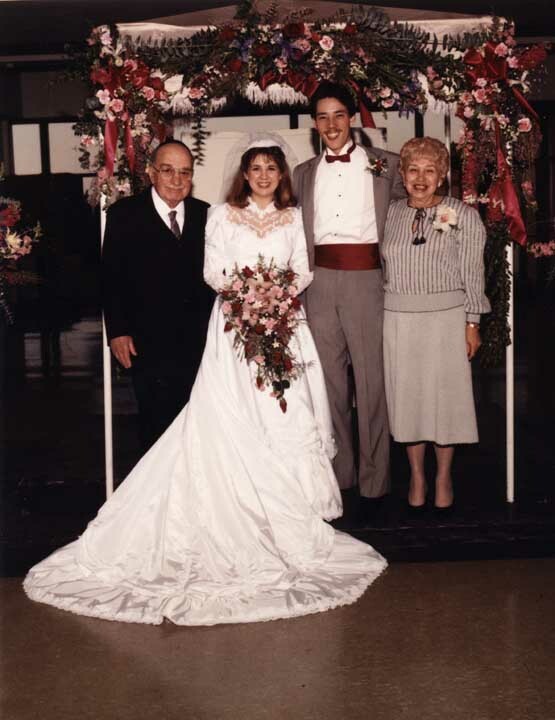 “In the spring of 1978, Polly (in a wheel chair), Adele, and I traveled down to Florida to see Jordan in spring baseball training for Haverford College. We had great fun and I never once heard Adele complain about the hard work she had to do in taking caring of Polly either when we went on trips or when we were at home. 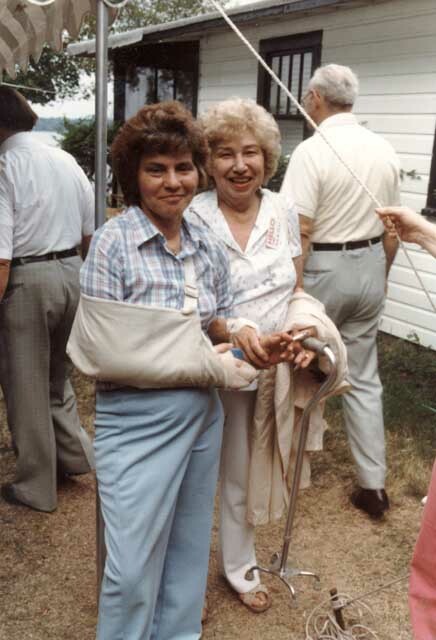 Adele and Pauline Kerber on a trip after Polly had learned how to walk again. Polly, addicted to cigarettes, died of lung cancer in 1988, thirteen years after her stroke. It is not a cliché to say that Paul Gass was Adele’s pride and joy, and her comfort in her old age. Photos of Paul dominated her photo collection. “I believe that everybody here knew my mother personally. She was born in Russia. Her own mother, Gittel, was killed in a pogrom when Adele was a child. “My mother’s Hebrew name was Udl. She was named after the daughter of the Baal Shem Tov. 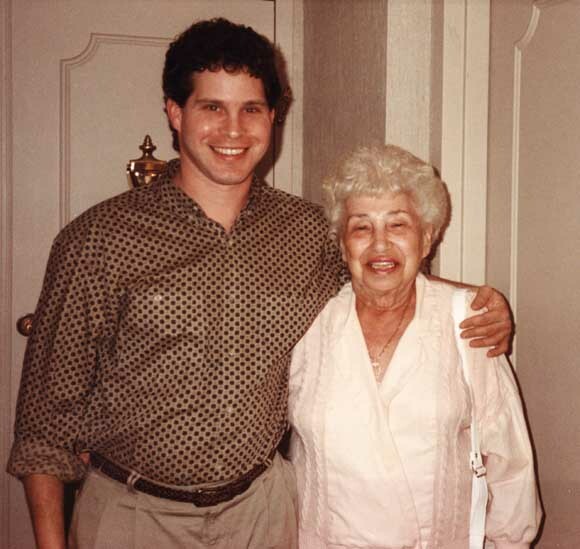 Adele is a Yiddish word and stands for a ‘person of kindness and nobility of character.’ My mother lived up to her name. “The Ba’al Shem Tov was the founder of Hasidic Judaism. He was a very spiritual person who loved, and believed in helping, every human being. In that sense, my mother was like a daughter to him. “Her father of blessed memory, Jacob Korff, was the Zviller Rebbe in Russia and the Grand Rabbi of Boston. Adele was one of nine children. 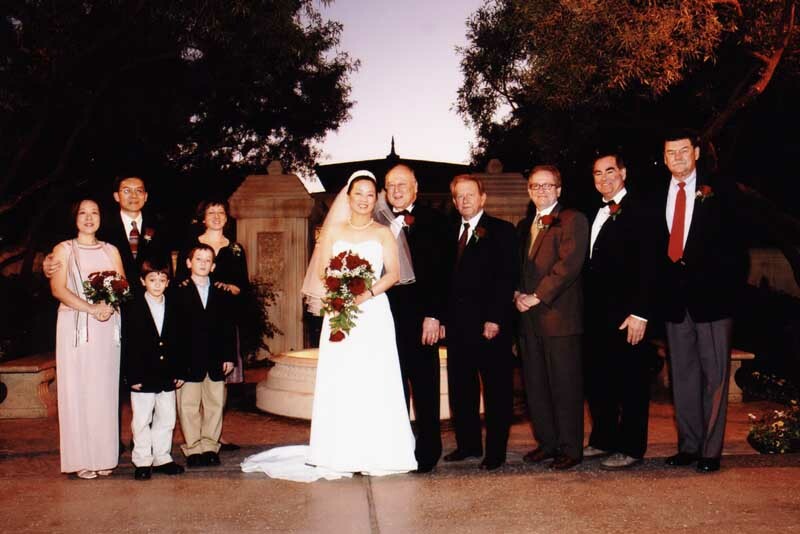 The others are: Rabbi Baruch Korff, Rabbi Nathan Korff, Betty Korff Berkowitz, Max Korff, Molly Korff Hixon, Martin Korff, and of blessed memory Rabbi Samuel Korff and Pauline Korff Kerber. 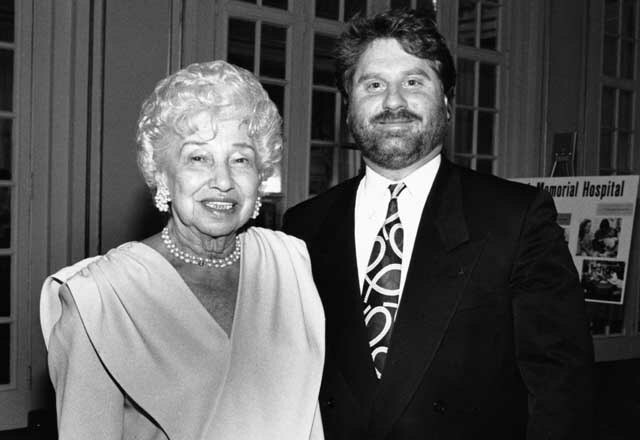 “My mother loved one man in her life, her husband of blessed memory, Max Gass. They were married for more than 50 years. She lived in Chelsea and Winthrop all her married life. 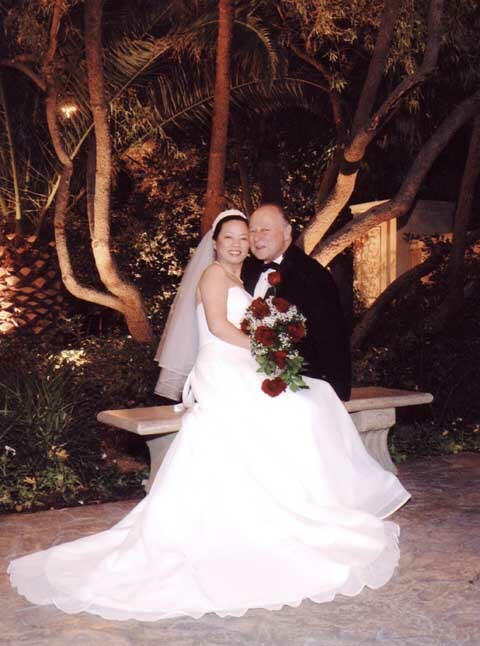 She has two grandchildren, Lisa Gass Kochanovsky and Leslie Gass, and three children—of blessed memory my brother Jay and sister Janet—and myself. 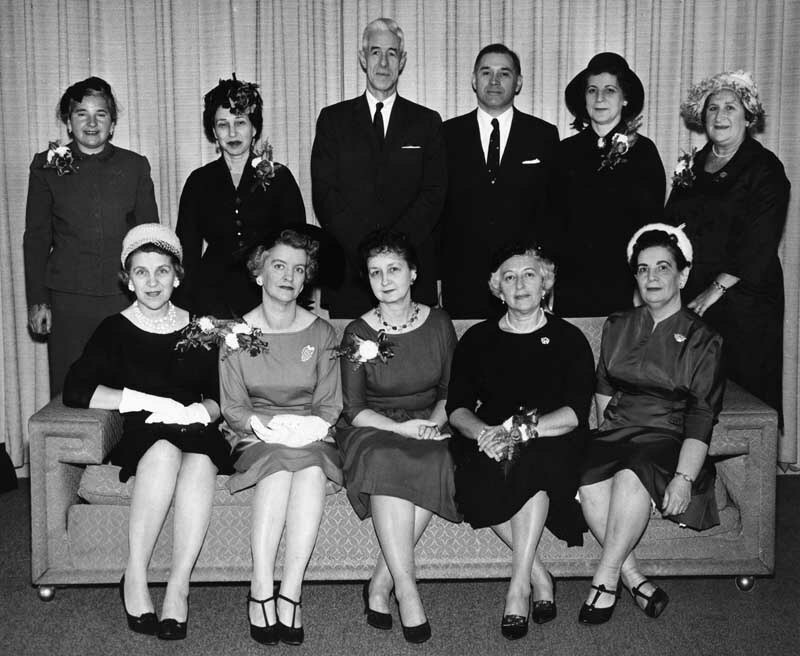 “Most of my mother’s personal interests focused on family, friends, and organiza­tions. She played golf and bowled until ten years ago. Although not known for her athletic prowess, she won two or more bowling trophies. She liked to play cards with close friends. In the sixties it was canasta, today, kaluki. “Adele was a world traveler—to China, Australia, Russia, South America, Europe, Africa, and many times to Israel. While traveling she often stopped the tour bus or taxi when she saw a mezuzah on the doorpost. She would ring the bell, introduce herself as a fellow Jew, and would be warmly welcomed. 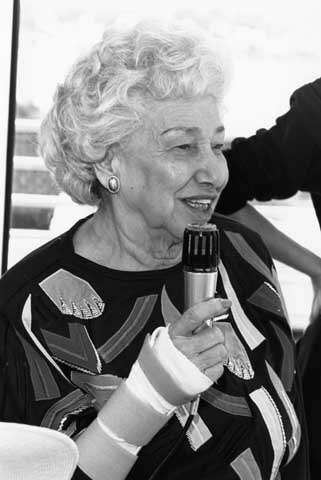 She was then not only able to see the country but was also introduced to the Jewish life of the people of that country. 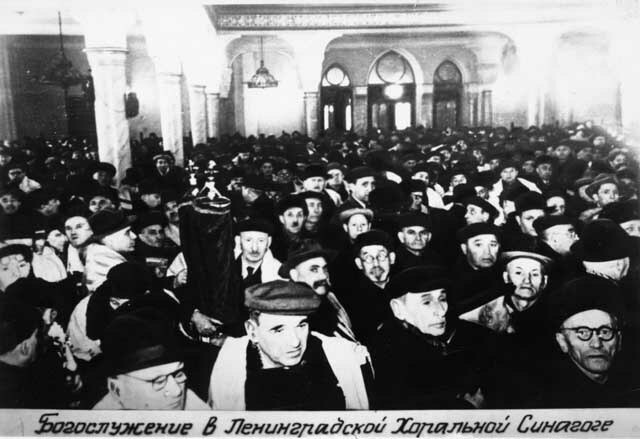 On a trip to Moscow, Adele visited this synagogue. Among the congregants was a woman who remembered her mother and father from Zvil. She described Adele’s martyred mother as a beautiful and wonderful woman. “When my mother was around young people she would beam. You could see the joy when her grandchildren, nieces, and nephews called or visited. She loved all children. “She spoke from the heart—If it was in her heart, it was on her tongue. She was always right to the point; feisty and compassionate, strong-willed and tough. She has, and probably still has, a very strong spirit. She believed that after a body dies, the spirit lives on. “Nothing was below her dignity to help any human being in need. She had great intuitive ability with regard to people. Her connection with people and organiza­tions are long-standing and deep. It didn’t matter whether the person was a clean­ing person, a friend, family member, politician, entertainer, or whether the person was gay, black, or brown, she bridged generations—she was everyone’s Auntie Adele. “She had no patience for takers or for people who did not do the right thing. If you did not do the right thing she let you know it and she could use strong language. She also believed that everyone could change and become a good person. She was a no nonsense lady. In two seconds or less you knew what she wanted or what she was thinking. “My mother was involved in many organizations. 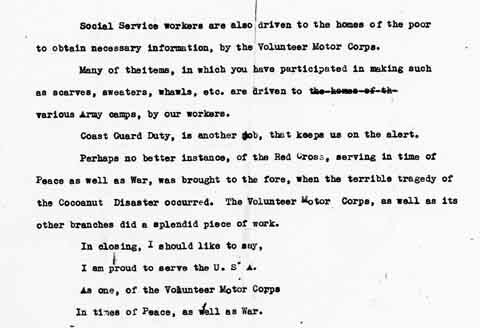 One activity not commonly know is that my mother drove a truck, an ambulance, and even a motorcycle for the Red Cross during World War II. 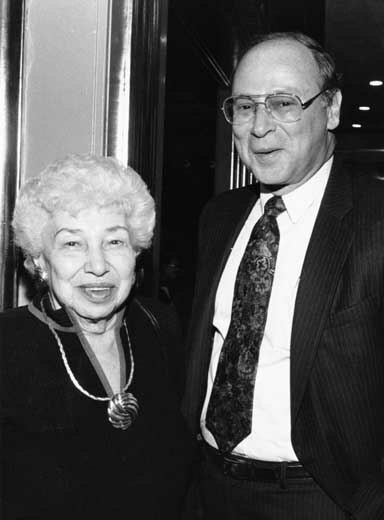 “She was a member of the Board of Directors and Executive Committee of the Jewish Memorial Hospital. For more than 55 years she was a tireless worker. 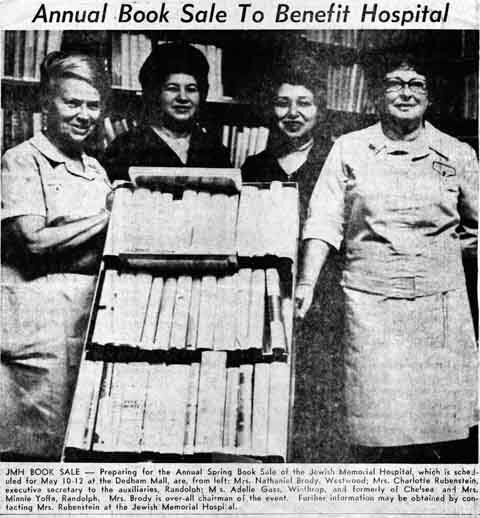 She was president of an auxiliary for the hospital, which attracted many attendees to its fundraisers. 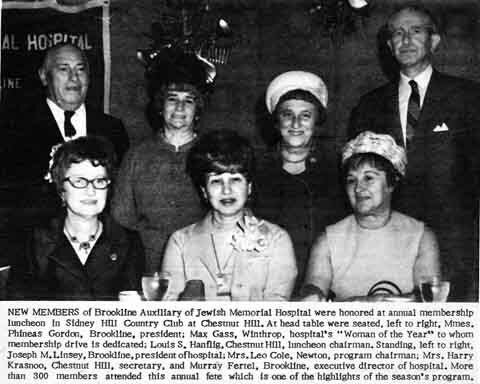 The people enjoyed coming, they contributed whatever they could, and over the years these contributions yielded hundreds of thousands of dollars of support for the hospital. 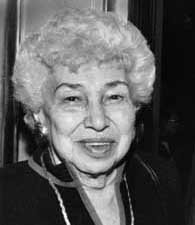 “There was nothing my mother wouldn’t do for a patient at Jewish Memorial, from cleaning bedpans to establishing a beauty salon. She provided invaluable input at board meetings. She had great organizational skills and managed major functions from celebrity night to fashion shows, bus trips, and auxiliary meetings. EVERYONE KNEW that when Adele Gass was involved in a project it was going to be a success. If she needed a speaker or an entertainer for a charitable function at a charitable price, she wouldn’t take no for an answer. “She was comfortable at being in charge. 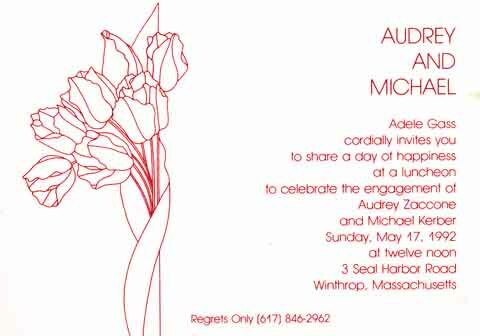 She decided how this funeral was to be arranged and worried that her family and friends might be inconvenienced. “She had great love for many people and everyone could feel it. During the past two weeks, friends, family, and nurses described her as a great lady, an amazing lady, a person with a lot of heart, caring, a person who gave strength and was helpful dedicated, supportive, and loving. “Everyone here knows that there is nothing that my mother wouldn’t do if she could help any of us in need. It was at Jewish Memorial Hospital that she met Rabbi Lieberman. She knew him more as a warm caring and sensitive human being than as a rabbi. She asked me to have him lead the prayers here so as to relieve the grieving rabbinical members of the family of this duty. 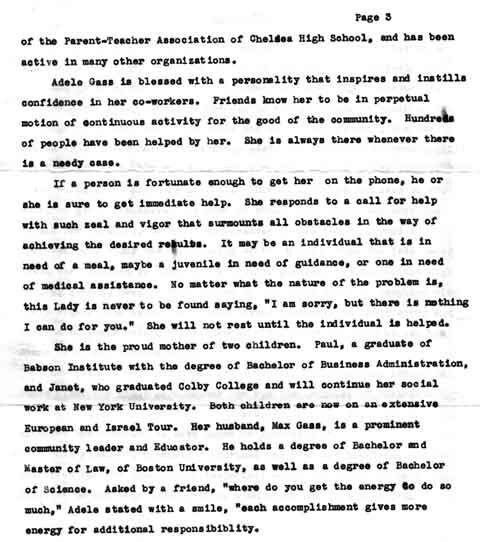 “A recent interest of my mother’s was Keren Or, a school for the multi-handi­capped in Jerusalem. She was asked to speak at a fundraiser for this organiza­tion in New York City to express what she experienced while visiting their facility in Israel. When she came home she asked me if she was a good speaker. I asked why. She said that as she was speaking the noisy room got quiet, a lot of big wheels in the room seemed to be moved, and surprisingly, Keren Or received checks and pledges to complete their building project. “I believe my mother spoke from the heart and when a person speaks from the heart the way she did, you had to listen. In her own way she could reach or connect with people at any level. “During the past two weeks of my mother’s life, we talked about our lives—past, present, and future. I expressed my sorrow and told her I would miss her. She struggled to say that she loved me very much and was sorry she could not give me a hug. She expressed her love for Rosalie and listened to Rosalie’s music often, which helped to make her more peaceful. The music of Paul’s long-time companion Rosalie, comforted Adele. “She was happy and grateful that her grandchildren were able to visit once more just before her time came. She was grateful for the many people who visited and called, including her close friends. “My mother had no fear of death. Her disease was diagnosed 1½ years ago in my presence. She said when her time came she would be with some very beautiful people who had passed on before her. Her mind was very strong to the end; the passing was peaceful. However, it may be said today that the heavens are crying with her passing. She had no regrets and believed that she accomplished a lot in her life­time. She loved us all dearly. A family should care for each other. We should try to be closer all the time. Lead a good and full life. 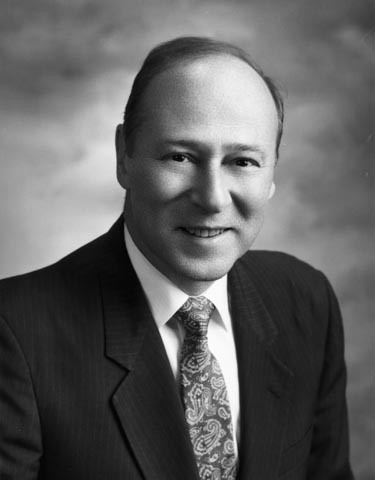 Adele’s brother, Baruch, later helped him with the translation. “Adele (Korff) Gass of Winthrop died Friday, November 26, at her residence of cancer after a long illness. She was 76 years old. 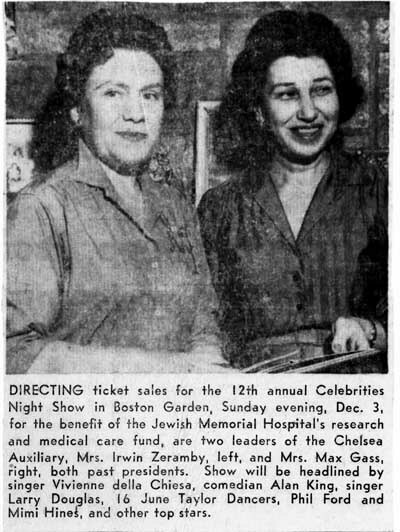 “She was a director, member of the Executive Committee of the Board of Directors since 1957, and major philanthropist of the Jewish Memorial Hospital and Rehabili­tation Center in Boston. “Born in Russia, she came to this country at the age of nine. She was the daughter of the late Grand Rabbi Jacob I. Korff, who was also the Zehiller Rebbe, and Chief Rabbi of Ukraine, Russia. She was a direct descendant of the Ba’al Shem Tov and named after his daughter. 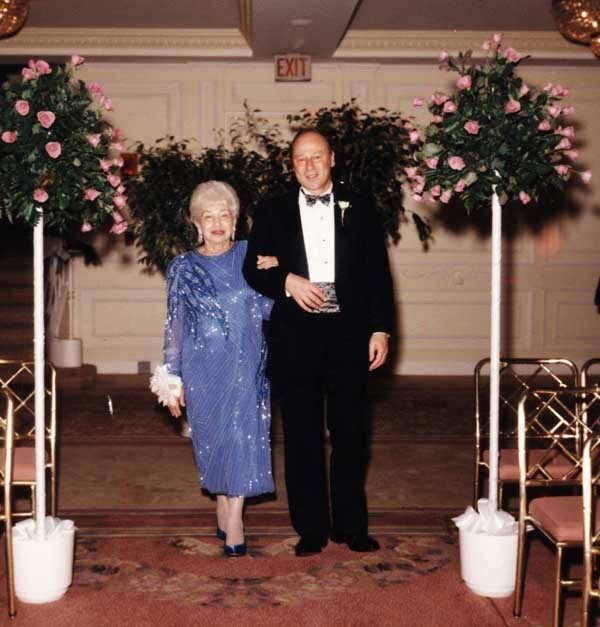 “Growing up with her father, who boarded homeless travelers, she found it natural to volunteer most of her time to patients at the Jewish Memorial Hospital and Rehabilitation Center for over 55 Years. 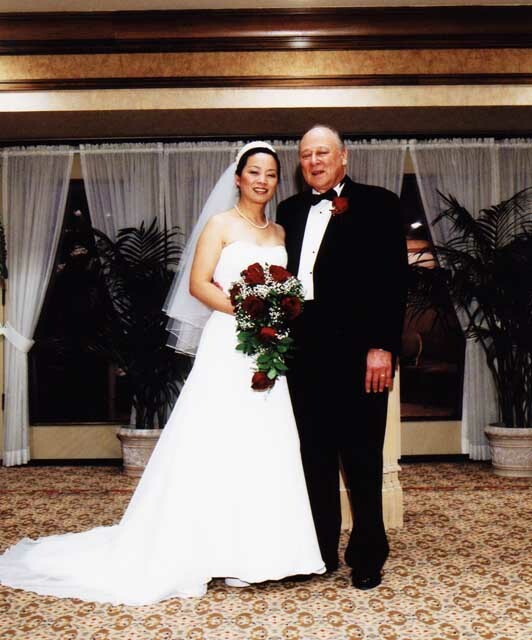 She became involved as the hospital shortly after her marriage at age 17 when she began visiting a neighbor who was hospitalized there. “Moving to Chelsea, she spent the next 30 years volunteering six days a week at the hospital from early morning until late afternoon. 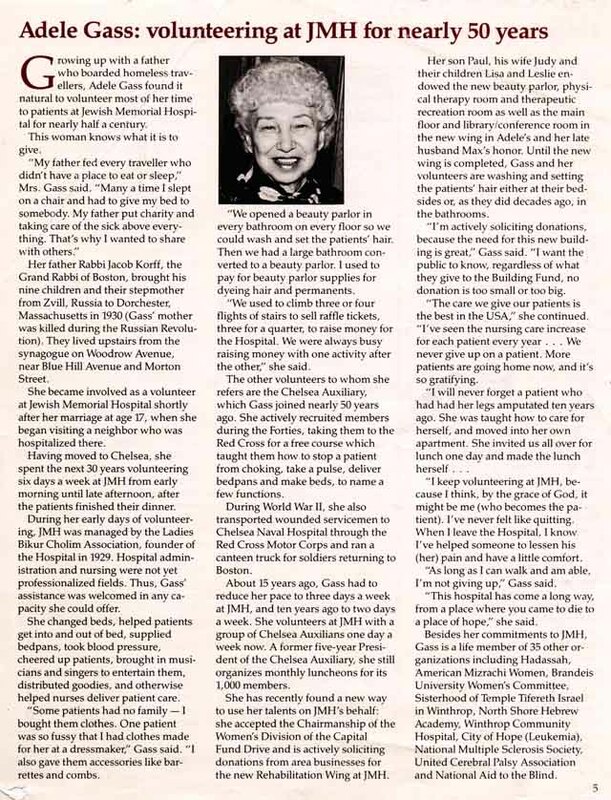 She changed beds, helped patients into and out of bed, supplied bedpans, took blood pressure, cheered patients, brought in musicians and singers, distributed goodies, and helped nurses deliver patient care. She bought clothes for patients, had clothes made for them, and gave patients accessories such as barrettes and combs. 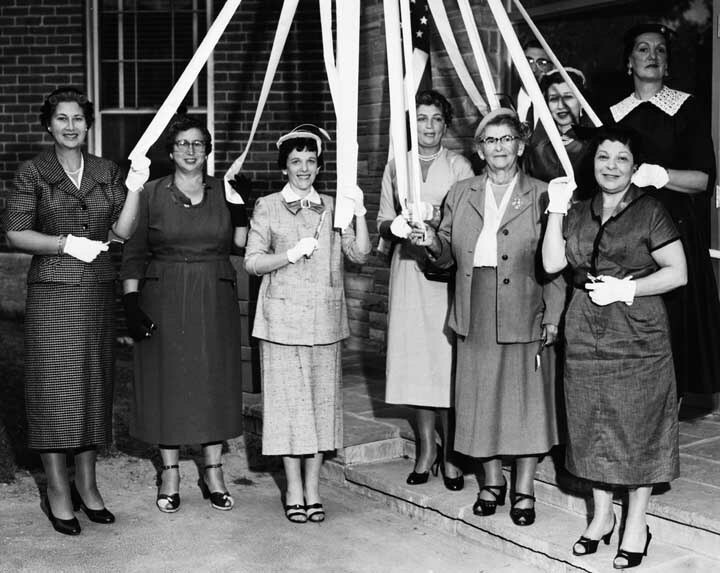 She actively recruited members for the hospital during the ‘40s, taking them to the Red Cross for free courses. “About 20 years ago she had to reduce the pace to three days a week, then to two days, and finally once a week. 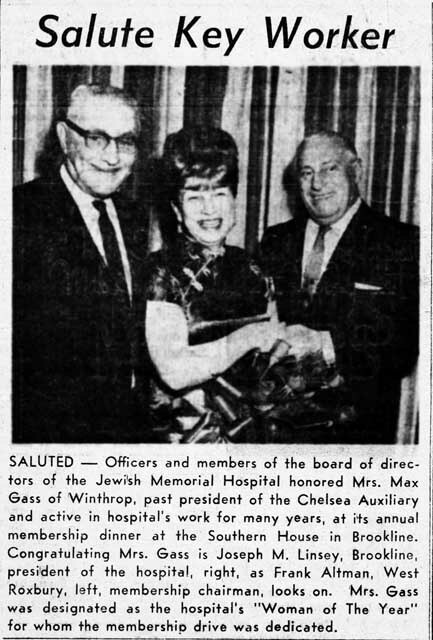 She was president of the Chelsea Auxiliary of the hospital and until recently organized luncheons, fashion shows, and celebrity night galas for the benefit of the hospital. She was also active in the hospital’s capital needs campaign and founded and endowed an in-house beauty salon for patients at the hospital. She and her family endowed an entire floor of the hospital’s rehabilitation wing. This article provides a retrospective of Adele’s life-long service to those in need. 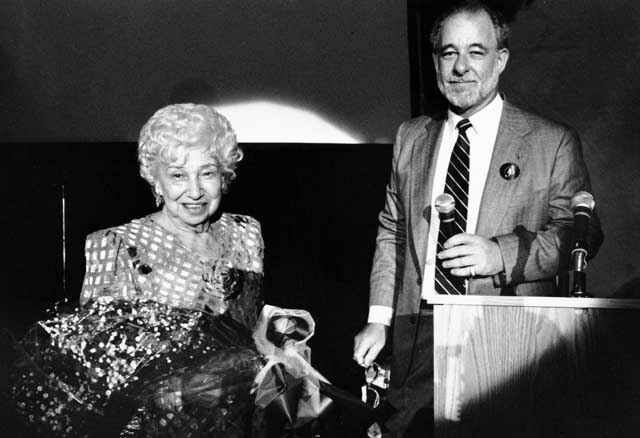 “Besides her commitments to JMH Rehab, she was a life member of 35 other organizations. 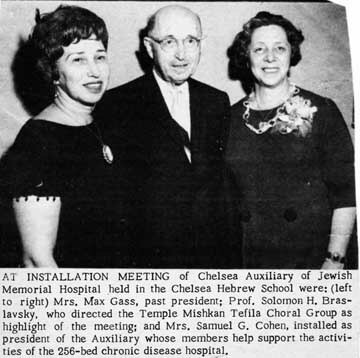 Among them were Hadassah, Brandeis University Women’s Committee, sisterhood of Temple Tifereth Israel of Winthrop, National Multiple Sclerosis, Winthrop Community Hospital, United Cerebral Palsy, Keren Or Center for the Multi-handicapped of Jerusalem, and many others. dele had the last word. 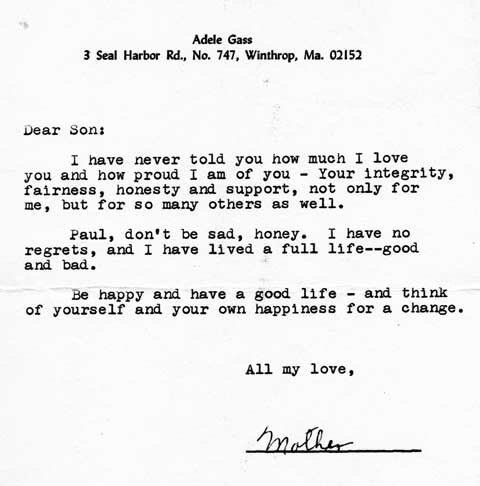 Shortly before her death, she wrote this note for Paul. In 2005, after years of losing money, Jewish Memorial Hospital was sold to a for-profit company. If Adele had lived to see this turn of events, she would have been broken hearted. 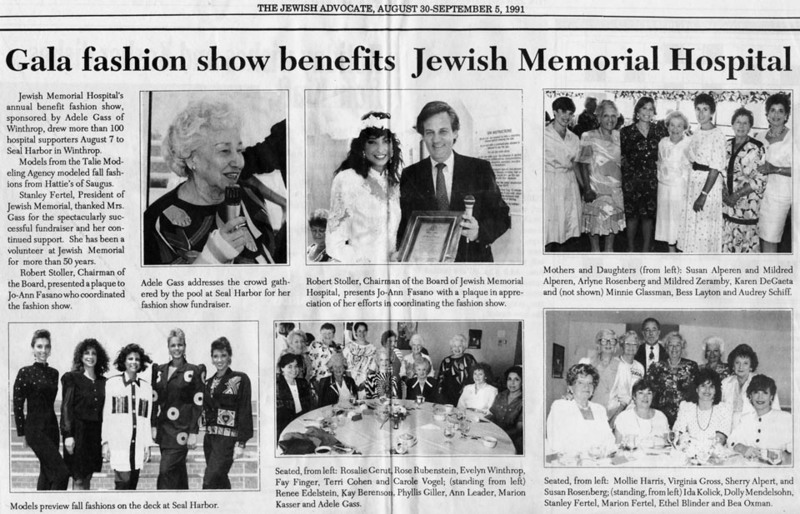 “Fashion Show raises $3,000 for Jewish Memorial Hospital,” Jewish Advocate, Boston, undated, fall 1988.